Rail connections that provide transport alternatives will ultimately be the first choice for customers seeking reliable options as well as opportunity. Customers value flexibility and more importantly, trust. The more integrated, the better. Take the Union Pacific Railroad’s Tacoma South Intermodal Terminal, for example. It covers more than 40 acres of land, is equipped to handle 150,000 annual lifts, and has a location next to western Washington’s warehousing, transloading and distribution centers, and local highways. The TacSim service runs between the Pacific Northwest and the major markets of Chicago, the Midwest and the eastern United States, creating a major competitive advantage in the region. The location and commodities provided create more opportunities for innovative efficiencies and options. Prior to the October 2018 launch of Union Pacific Railroad’s Unified Plan 2020, customer needs were identified as a major contributor to the implementation of Precision Scheduled Railroading principles. At the time, expectations were simply not being met and the 2020 Plan was the solution to resolve the lack of customer satisfaction and get back to a place where customer needs were more than just met. Union Pacific announced a shift in leadership early this year to provide additional leadership and expertise for Unified Plan 2020. Jim Vena, the former executive vice president and chief operating officer for Canadian National, stepped into the position of chief operating officer as of Jan. 14. 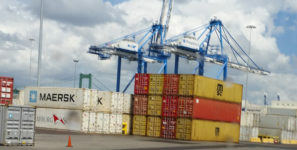 From leadership to automation, on-dock rail connections continue to make strides in competitive regions by raising the bar for customers and creating a fresh approach through higher standards. Customer demands will only continue to rise and challenge the industry to not only meet but exceed expectations, and it’s ultimately up to the experts and leaders to ensure operations from the ground up are set up for success.